Maximise performance and your return on investment with the Ditch Witch C24X Walk-Behind Trencher. Our exclusive CX Track design delivers better traction and maneuverability in a more compact design for tighter jobsites. Responsive, easy-to-use touch controls provide smoother operation. And superior serviceability—a simple, open design for easy access and no daily grease points to worry about—means less maintenance time to keep your C24X rental-ready. Get proven Ditch Witch reliability in the latest, patent-pending track design: only with the C24X. A reliable 22hp Honda® engine keeps the C24X performing for rental income you can count on, year after year. 915 mm digging depth for efficient installation of pipe and cable. 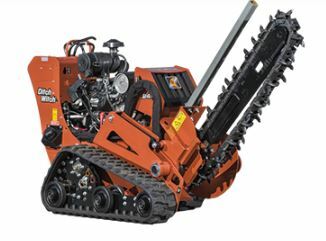 Utilises the Ditch Witch 35K digging system, specifically designed to work with Ditch Witch trenchers to optimise production. Exclusive, patent-pending CX Track design puts more track on the ground for better traction while increasing stability for better production. Standard outboard bearing support stabilises the headshaft and auger, for reliable productivity trench after trench.